We have the rentals to help with virtually anything you can dream up for your backyard improvement projects. We stock all the rentals and many of the products to help you establish that new lawn, build a new parking area, fence, deck, patio, raised flower beds, pathways, and water features. Start building your dream landscape with professional tools. The Vermeer BC625A Wood & Brush Chipper is great for your light or medium duty brush chipping projects. Its auto-feed system accepts brush from 1” up to 5” in diameter, and its rotating discharge allows you to direct the chips. The commercial-duty Vermeer BC625A is a dedicated, tow-behind wood chipper. Towing the chipper requires a 2” ball (we can also provide the ball with or without a hitch at no extra cost), or we can deliver and pick-up the unit for an additional charge. Please note: wood and brush under 1” in diameter will NOT safely feed into the BC625A – use the chipper/shredder combo unit instead. An essential part of the lawn-care line-up. Professional quality. Our self-propelled heavy-duty Ryan aerators core 2-3/4” plugs along a 19” wide path. Punches up to 9 holes/ft2 at 29000 ft2/hour. This unit is also referred to as a Power Rake or a Lawn Comber. Our dedicated dethatcher units are compact and utilize flail-style reels to remove an 18” wide path of thatch from your lawn. Helps take the back-pain out of lawn edging. 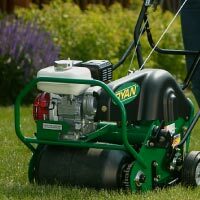 This gas-powered lawn edger takes all the work out of your garden edging projects, thanks to its 4 HP Honda motor and 10” rotary blade. We rent commercial Snapper and Lawn-boy brand mowers for tough jobs. This walk-behind bagging mower features a 21” deck, a Honda gas engine, and an easy-to-empty rear grass catcher. Light-duty and easy to operate; only for use in loose soils. The Mantis Tiller is the incredible lightweight tiller that has made gardening easier for more than a million people. This 20-pound tiller is a favourite of home gardeners all over the world. Effective in small and medium sized garden beds, or areas with relatively soft ground. We carry both light- and medium-duty front tine rototillers. These agile machines will till 13” to 26” wide paths at depths of up to 12”. Used in tough ground, our rear-tine tillers require some muscle to maneuver. Our self-propelled rear-time rototillers feature multi-speed transmissions while boasting an 18” till width. Great for large and tough projects. Available in 12” wide and 18” wide models. Our rugged, self-propelled sod cutters will cut and remove paths of sod up to 18” wide. The cutting depth is adjustable up to 2” deep. Uses: for sand, soil, and rock (up to 8” diameter). Feed: with loader buckets up to 78” wide. Stop paying to haul it away! Turn that pile of excavated material into useful soils for your next landscaping project. This portable screener is designed to be run in conjunction with a small tractor or skid-steer loader. Our T-650 Bobcat is the perfect loader because it can pick up and move the screener around on the jobsite with special lifting lugs designed to securely “connect” with the bucket of the loader. Three screen sizes available – heavy duty 2”×2” for rock/gravel, 3/4”×4 for rough screening of soil, and 3/8”×4” for generating fine soil. Easily adjustable screen deck angle to maximize production depending on how screening material is reacting on site. With a 1/2 yard bucket loader you truly can create up to 25 yards (volume of a truck and pup) per hour of fine screened topsoil. We’ve verified this with our own trial runs. Cheap to run: runs off electric 110V power outlet or small generator! Do the math: turn that mixed waste material on your jobsite into planting-grade topsoil quickly! Take an 8 hour work day with a Bobcat loader and you will be able to create 100 yards of material – or enough to cover 3,250 ft square at 4” deep – a nice new lawn indeed! We’ve also found the rock and rubble “waste-overs” from the screening process can be used as a good solid fill material. Please note: Dry or slightly damp soils are best, and easiest to screen. Wet, clay-type or muddy soils tend to clog up the screens and do not screen well. Dry periods from late Spring to early Fall is the best time to use this screener in most cases. Note: This simple machine can save you a LOT of money in trucking soil mixed with rock offsite and buying, and then trucking suitable replacement soil back. Please discuss your options with us today! The best tool available for spreading loose base materials. This lightweight, long-handled magnesium rake features a dual-edge head: one edge is serrated, which creates ridges in the sand, allowing the sand to dry faster. The flat edge on the opposite side of the rake is designed for spreading loose base material and joint sand. Increase your productivity and concentrate on what makes you money: laying pavers! With it’s rugged construction and large 12” diameter tires, the Probst Paver Cart can move up to 880 pounds at a time. The adjustable clamping width means this unit works with a large variety of both un-banded and banded paver skids. The bottom line: this tool saves you time and energy – use the Paver Cart once and you’ll never want to move pavers with a wheelbarrow again! Perfect for both creating and maintaining precise 45 and 90-degree angles. The Paver Square Pro is the quickest and easiest way to establish 90-degree angles when starting to lay pavers. Useful in any application where accurate 45-degree and 90-degree angles need to be established or maintained. Folding design allows for easy transportation of this 48” × 68” tool. This simple tool assures accurate and consistent lines when marking pavers. The QuickDraw marking tool is designed to take the time out of marking pavers for cutting along curved edges. Simply attach the tool to your flexible edging, mark your desired soldier-course width, and drag the tool along the edge to mark your paver cuts. In no time you’ll have a perfectly spaced mark along your pavers, ready for cutting! Rent all three of the above tools for one low rate – it will make your job easier and faster. The Sand Pull Pro is an adjustable screed set that varies in width in order to accommodate any project. There are two “base” pulls included, one at 3’ wide and another at 5’ wide. The set also includes a pair of adjustable extensions that will add up to an additional 2-1/2 feet to the overall with. Therefore, the 3’ pull can extend up to 5-1/2 feet, and the 5’ pull can extend up to 7-1/2 feet. Allows one person to screed up to 7-1/2’ widths using the weight of their body and the power of their leg muscles. The Sand Pull is built to make the screeding process faster and easier. This double-sided tool allows you to use one edge to pull back excess sand to where it’s needed next (rather than using a shovel), while the other side allows you to fill in screed pipe and footprint voids. This set of three sand screed boards are built from high-strength aluminum and are regarded as the toughest in the industry. This set includes three widths: 48” (4’), 72” (6’), and 96” (8’). Don’t waste your energy moving slabs around the jobsite – these tools greatly reduce fatigue. Designed to accommodate both paver slabs and retaining wall blocks, this tool is great at allowing tight placement at the laying edge without pinching your fingers! Has a 130 pound capacity and an opening adjusts to accept slabs 14-1/2” to 24”. The big-brother to the Slab Grabber, the Slab Handler is a two-person tool designed to make moving large slabs effortless. Weight capacity of 220 pounds, and will accept slabs from 20” through 39” in size. Great for moving large slabs over long distances, such as from the driveway to a restricted-access backyard. The easiest way to split large (and small) retaining wall blocks. Forget about splitting blocks with a mallet and chisel – this is the easy and efficient way to do it! Large capacity accepts blocks up to 12” thick. The simple operation produces the same look and texture as a split-faced block, making it ideal for splitting corner units with the Versa-Lok range of wall blocks. A great alternative to cutting with a saw or splitting with a chisel, and it even works with paving stones! Delineators are handy tools to manage traffic on your worksite. These 42” posts with reflectors are movable and can easily be positioned on your driveway, parking lot, or grounds to channel traffic safely. Their bright fluorescent orange post colour makes any worksite noticeable – and safe! 36-inch wide path; made from lightweight aluminum. This 36” landscape rake is built entirely from aluminum, making it lightweight and easy to handle; an indispensable tool! A simple, versatile tool – very popular item! Nothing fancy here: fill the big plastic drum full of water and presto: one manual lawn roller ready for some serious flattening. Generates wind speeds up to 225 KM/H. The Shindaiwa SV212 can be used as a handheld shredder/vacuum or easily and quickly converted to a handheld blower (vacuum bag and blower tubes included with rental). Aggressive 4-blade shredder reduces yard debris volume 12:1. Fully adjustable “cruise control” throttle position control for ease of use. Generates wind speeds up to 320 KM/H. This commercial-grade Shindaiwa blower provides remarkable performance with low engine noise, low emissions, and excellent fuel economy. Fast and flexible, the EB3410 is often quicker than a backpack blower from truck to task, making it a great choice for smaller jobs. Auger not included in rental price (scroll up for auger rates). Premium ground augers for use in the 1-man and 2-man posthole augers. It is recommended that 12” bit ONLY be used with the 1-man auger. Auger bits available: 4-inch, 6-inch, 8-inch, 10-inch, or 12-inch diameter. Bits not included in rental price (scroll up for bit rates). The Ground Hog HD99 is a towable hydraulic earth-drill that is designed to be powerful, easy to use and require very little maintenance. With its 9hp Honda engine, the HD99 can easily turn any of our available augers (4-inch, 6-inch, 8-inch, 10-inch, and/or 12-inch diameter). The use of hydraulics allows the HD99 to have variable auger speed and reverse which is very useful if the auger gets stuck. The HD99 is designed to take the load off of the operator by being almost perfectly balanced with an 8-inch auger attached, and the right angle design eliminates torque to the operator. There are also 3 handlebar positions that allow for normal drilling, as well as close up drilling next to an obstacle such as a wall or fence. Large highway rated tires make the HD99 easy to maneuver around the job site and there is a locking mechanism on the digging head that allows the auger to be held up and out of the way for moving the machine around the job without having to disconnect the auger. Auger bits available: 4-inch, 6-inch, 8-inch, or 10-inch. The Ground Hog C-71-5 is two-man earth drill designed to deliver years of reliable service with superior performance. It has been a proven performer for over 40 years. Its rugged design promotes durability and requires very little maintenance. The heart of this unit is our time-tested transmission. The transmission is an efficient worm drive design utilizing alloy steel shafts, large tapered roller bearings and the standard 7/8” square auger drive. Both operator positions are equipped with individual stop switches and tubular steel handlebars. Old-style, “clamshell” design. Now also available in the “scissor” design with fibreglass handles. Great for digging post-holes in loose soil, our “clamshell” shovels dig deep but not wide. The simple design lets you dig any size hole. The PB270 has a 23” wide sweeping path and a 1.5 HP gas motor. Whether you’re cleaning up, spreading or preparing a surface, the PB270 PowerBroom delivers the extra power you need. Designed for continuous, heavy-duty operation, the PB270 can do the job more efficiently than any other method. Use of this tool is essential for professional artificial turf installation. The power broom head will work the infill material evenly into the base of the turf fiber which is needed for proper fiber support, as well as place the infill as ballast for the entire field. Spreads materials over a distances, rather than dropping below the spreader. The broadcast-style spreader uses a lazy-susan type wheel to disperse your lawn materials. A simple adjustment on the handle controls the flow rate. Lays material right underneath the spreader, rather than broadcasting it. The drop spreader lays a uniform 17” wide strip of material directly under its hopper. A handle-mounted control allows for simple flow adjustment. The Vermeer SC252 Stump Grinder has a range of features that reduce the act of stump grinding to a relatively simple task. By slowly sweeping the SC252’s 19” cutting wheel in shallow, consecutive passes, the stump can be ground to a depth of up to 13”. The SC252’s hydraulic controls are clearly labeled and precise, and our model features the Autosweep option for safely regulating the speed of the pass across the stump. Dual wheels (shown) are also available for situations where extra traction and/or improved floatation is required. Please note: this unit is designed to operate at slow speeds only. The SC252 can only be used to grind stumps that have been adequately prepared and cleared of debris. Failure to heed warnings could result in machine damage and/or serious operator injury. The Vermeer RT100 walk-behind trencher is a simple solution to any shallow trenching project. The electric start, user friendly RT100 is capable of digging a 4” wide trench up to 3 feet deep, making it ideal for laying irrigation line. Guaranteed to considerably reduce time and labour. Rental of the Vermeer RT100 Track Trencher requires a tilting utility trailer for transport. The rental cost is $18.00 when you rent the trencher. The trailer requires a 2” ball. If you don’t have one, we also rent the ball with or without a hitch. If you prefer, we can deliver and pick-up the unit for an additional charge. Walk-behind trenchers are ideal for a variety of projects, and now Vermeer has one that’s so easy to use it gets the job done faster. The RTX100 features the exclusive VZ steering system, which makes steering a breeze even in tight turns. With the RTX100, users can maneuver easily into confined jobsites and even counter-rotate from a stationary position. Equipped with rubber tracks, the RTX100 offers a whole new level of flexibility and versatility for the jobsite. The rubber tracks enhance floatation and traction when working in difficult ground conditions, as well as allowing the operator to cross-trench. The RTX100 offers the durability and rugged construction expected in Vermeer equipment, and its easy operation (including electric start) makes it a smart rental for both homeowners and contractors. Rental of the Vermeer RTX100 Track Trencher requires a tilting utility trailer for transport. The rental cost is $18.00 when you rent the trencher. The trailer requires a 2” ball. If you don’t have one, we also rent the ball with or without a hitch. If you prefer, we can deliver and pick-up the unit for an additional charge. We carry a variety of gas-powered handheld brushcutters: commercial-duty weedeaters modified with saw blades instead of trimmer line. Walk-behind design for reduced strain over large areas. Our walk-behind “Billygoat” brushcutter cuts a 24” path through the densest brush and weeds, small saplings and other problem vegetation. Both a hedgetrimmer and chainsaw attachment are available with this rental. This multi-tool Shindaiwa acts as a power-head to drive a variety of tools. Currently available are an articulated hedgetrimmer (23” blade/95” total) and pole pruning (10” guide/105” total) chainsaw attachment. Gas powered, double-sided blade design. This heavy-duty 2-sided 30” gas hedgetrimmer features new Shindaiwa C4 technology and powers through the thickest, toughest hedges. Electric powered, single-sided blade designs available. Our Little Wonder electric hedgetrimmers are surprisingly rugged for their size and weight. Cuts up to 1/2” diameter. The splitting wedge automatically returns to the start position. Our WX500 series log splitter features an auto return valve, 2-stage 11 GPM pump, 9” wedge height, a 24” long stroke, and an 5.5 HP Honda engine. Requires 2” ball to tow; includes light adapter if necessary. Our professional-grade Corona brand bypass loppers measures 26 inches in length and can cut up to 1-1/2” diameter branches. Comfortable grips make this tool easy to handle. Extends from 6’ to 13’ in length. Our pole pruning saws feature curved cutting blades and lever-action branch trimmers. Extends from 6’ to 13’ in length. Familiar handheld design. Heavy-duty line and safety harness included. We carry a variety of commercial-duty gas weedeaters. Rental includes heavy-duty line, and a harness is available at no extra cost.